Looking for inspiration to follow your heart and dreams? 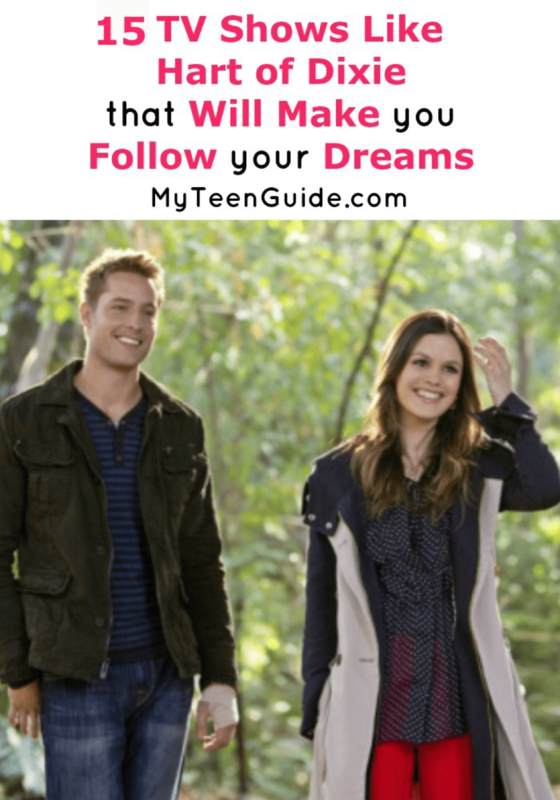 These Inspiring 15 TV shows like Hart of Dixie are just the inspiration you need, with a side of drama or fun! Add them to your binge watch list TODAY. Don’t forget to check our extensive 80+ tv shows list like your favorite shows. Download a printable version of the posts. It will be handy. Whether you love Hart of Dixie for the drama, the fashion or the one-liners but since the series ended you may need more tv shows like Hart of Dixie in your life. If you haven’t seen Hart of Dixie, you should add it to your Netflix cue immediately. The show is about sleek Dr. Zoey Hart who is from NYC but finds herself taking a job in Bluebell, Alabama after graduating from medical school. There is a bit of a culture shock when Zoey walks into Bluebell for her, and these characters who are funny, charming and quick-witted don’t disappoint. I couldn’t stop watching Hart of Dixie, but there are only so many seasons before it’s over so here are some other TV shows like it to watch! Watch it today (affiliate link. We get a commission if you make a purchase). Meet Jane Quimby. One minute she’s an outcast high-schooler, the next minute she was pursuing her fashion dream job. That’s what happens when someone mistakes you for an adult… well, sometimes anyway. Andie MacDowell also stars in Jane By Design, which is brought to you by the same team who produced Gilmore Girls. The show was canceled after its 2012 debut season, making it one of the best shows like the Hart of Dixie to binge on right now! As you can probably guess, Nashville is predominantly about the country music scene. At one point, the series had almost 9,000,000 viewers. The plot centers around Rayna Jaymes and Juliette Barnes. One of them is facing fading popularity, while the other one is learning what it’s like to be a rising star in the music industry. Nashville also debuted in 2012. It was canceled in the spring of 2016, causing thousands of fans to voice their dissatisfaction. Subsequently, CMT picked up the series. You can catch Season 5 on that network. If you like competitive college cheer leading, you’ll love all 22 episodes of Hellcats. Based on a book covering the same subject, the show takes you into the life of Marti Perkins. She is a pre-law student who just lost her scholarship. In an effort to secure a replacement, Perkins joins the cheer leading squad and goes on to attempt to win the nationals. Will her sometimes-irresponsible mother get in her way? Find out in one of the best shows like the Hart of Dixie on Netflix! Bunheads aired on ABC Family for one season. Meet Michelle Simms. Once a ballerina, turned Las Vegas showgirl. Sick of her dead-end career, she gets married and moves to a small town in California. After the tragic death of her husband, Michelle takes a teaching job at a dance school owned by his mother. The question remains. As a once-again “bunhead,” will she ever be able to adjust? There are 18 episodes in the series, which ran from 2012 to 2013. Pam Am stars Christina Ricci and Margot Robbie. It was a mid-season replacement show that ended up getting canceled very quickly, after just 14 episodes. The fictional series is about the pilots and stewardesses that made Pan American World Airways “THE” airline to fly in the 1960s. There was talk about Amazon picking up the show for a second season, because of Pan Am’s international appeal. Doctor Foster is a BBC show that first aired in 2015. It stars Suranne Jones as a city doctor living in a small town. She suspects her husband of having an affair and tries to find out the truth behind his shifty behavior. The more she learns, though, the more she discovers that she may have unraveled more than she bargained for. Off the Map is a medical drama television series that premiered on ABC on January 12, 2011 and ended on April 6, 2011, after just 1 season. Don’t let that scare you off, though, the show was actually pretty fantastic! The series is set in a South American remote village, where a group of doctors try to make a new start while helping people who don’t typically have access to medical care. Off the Map stars Valerie Cruz, Caroline Dhavernas, Jason George, Zach Gilfrod, Mamie Grummer, Martin Henderson and Rachelle Lefevre. Everwood is a drama television series that premiered on The WB (now The CW) on September 16, 2002 and ended on June 5, 2006, after 4 seasons. The series centers on Dr. Andy Brown, who moves to a small Colorado town, with his daughter, Delia, and his son, Ephram, after the death of his wife. Everwood stars Emily VanCamp, Treat Williams, Vivien Cardone, and Gregory Smith. Emily Owens, M.D. is a medical drama television series that premiered on The CW on October 16, 2012 and ended on February 5, 2013, after 1 season. The series showcases the life of Emily Owens, a first-year surgical intern, who is a bit geeky and very insecure. Emily Owens, M.D. stars Mamie Gummer. Fun fact: Marnie is the daughter of silver screen legend Meryl Streep. Dr. Quinn, Medicine Woman is a western drama television series that premiered on CBS on January 1, 1993 and ended on May 16, 1998, after 6 seasons. The series focuses on Dr. Michaela Quinn, who leaves the big city of Boston to settle down in a small Colorado town. Dr. Quinn, Medicine Woman stars Jane Seymour. Heartland is a Canadian family drama television series that premiered on CBC on October 14, 2007. The series focuses on Jack Bartlett, a ranch owner; his two granddaughters, Amy and Lou Fleming and ranch hand, Tyler Borden, as they experience the highs and the lows of ranch life. Heartland stars Shaun Johnston, Amber Marshall, Michelle Morgan and Graham Wardle. Felicity is a college drama television series that premiered on The WB (now The CW) on September 29, 1998 and ended on May 22, 2002, after 4 seasons. The series centers on Felicity Porter, who moves from her home on the West Coast, to attend college on the East Coast, following her high school crush. Felicity stars Keri Russell and Scott Foley (currently playing Jake Ballard in Scandal). Jennifer Garner also played in 3 episodes in her pre-Alias days. Life Unexpected is a family drama television series that premiered on The CW on January 18, 2010 and ended on January 18, 2011, after 2 seasons. The series centers on Lux Cassidy, who spent 15 years of her life in foster homes. When she decides to become emancipated, it leads to finding her birth parents. Although it only lasted two seasons, this is one of my favorite shows like Hart of Dixie on Netflix. Life Unexpected stars Shiri Applebee, Britt Robertson, and Kerr Smith. Chasing Life is a drama television series that premiered on ABC Family (now Freeform) on June 10, 2014 and ended on September 28, 2015, after 2 seasons. The series focuses on April Carver, who was recently diagnosed with leukemia, as she tries to balance her work life and her family life. Expect to laugh and cry with her as she learns to cope with her diagnosis and keep it from letting her live life to its fullest. Chasing Life stars Italia Ricci. This spin-off from the hit show Grey’s Anatomy follows the adventures of Addison Montgomery after she leaves Seattle to join a private practice in Los Angeles. Although you’ll see some familiar Grey’s faces throughout the six-season series, the pacing is a lot different than its sister show. If you love Amelia on Grey’s Anatomy, this is a must-watch show to get her full backstory. Private Practice stars Kate Walsh (of 13 Reasons Why), Tim Daly, and Taye Diggs. While all of these tv shows like Hart of Dixie don’t take place in the heart of the south, they do have many features in common. Every show has a main character like Dr. Zoe Hart who follow their dreams, even in the face of adversity. Which one of these tv shows like Hart of Dixie is on the top of your “must-see” list?